Table: H 29.5" W 41.5" L 66"; chair H 37.5" W 18" D 19"
This table has a top with beautiful dark walnut heartwood and small accents of golden sapwood. The undersides of the rails have maple accent strips.The legs are made with tapered, bent, laminated walnut construction. 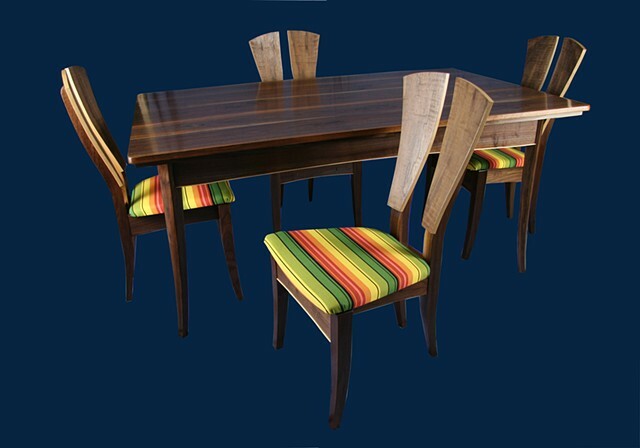 The chairs feature an upholstered seat; The backrest has a three dimensional shape to conform comfortably to one's back.